The management of pediatric cataracts is quite different and more complicated than the management of cataracts in older adults. Our center has extensive experience and specializes in the treatment of pediatric and infantile cataracts. Infant eyes are small and extremely soft which makes the cataract surgery much more difficult. Special techniques are required for pediatric cataract surgery. The Wright irrigation cannula developed by Dr. Wright for pediatric cataract surgery is used in many centers around the world and facilitates safe surgery. Virtually all adult patients who undergo cataract surgery will have an intraocular lens (IOL) placed in the eye at the time of surgery to replace the natural lens that was removed. Infants are different. Because the infant eye will grow significantly and is prone to extreme inflammation, an IOL is usually not placed in infants under 1 year of age. Instead, young infants will require a contact lens after surgery. Our center has years of experience with fitting infants with contact lenses. We use extended wear silicone contact lenses that can stay in place for up to 3 to 4 weeks before removing and cleaning. Another important aspect of pediatric cataracts is amblyopia. This is abnormal brain visual development because the image from the eye with the cataract is blurred. Treatment of amblyopia associated with cataracts requires patching of the good eye after surgery to stimulate use of the cataracted. Not all children with cataracts require surgery as partial cataracts can be managed medically and with optical correction. In general, visual prognosis is guarded; however, we have had excellent results with pediatric cataracts which have been published. For more information on pediatric cataracts go to “Patient Education, Read about Eye Problems”. Below are edited videos of pediatric cataract surgeries performed by Dr. Wright. Cataract is a white opacity of the normally clear lens. Note photograph shows a cloudiness within the black pupil – that cloudiness is the cataract. Wright KW, Christensen LE, Noguchi BA. Results of late surgery for presumed congenital cataracts. Am J of Ophthalm 1992;114(4):409-415. Wright KW, Matsumoto E, Edelman PM. Binocular fusion and stereopsis associated with early surgery for monocular congenital cataracts. Arch Ophthalmol 1992:110(11);1607- 1609. Wright KW. 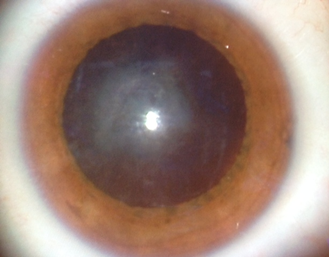 Should we aggressively treat unilateral congenital cataracts? Brit J Ophthalmol, September 2001;85(9):1120-26. Mocan MC, Wright KW. Monocular congenital cataracts. Is binocular vision too much to ask? At the Crossings: Pediatric Ophthalmology and Strabismus, pp.45-53. Proceedings of the 52nd Annual Symposium of the New Orleans Academy of Ophthalmology, New Orleans, LA, USA, February 14-16, 2003. Edited by Robert J. Balkan, George S. Ellis Jr. and H. Sprague Eustis. © 2004 Kugler Publications, The Hague, The Netherlands.